Vishnu incarnated as the half-man, half-lion Narasimha (his fourth avatar) to subdue a particularly powerful demon. Afterward, however, Narasimha himself became too powerful. To stop him, Shiva incarnated in the form of the Sharabha, an eight-legged man-lion-bird. Although said to be a lion, the Sharabha shown here more closely resembles a tiger, including body stripes formed by small snakes and sages. His head is eaglelike, but he has a human ear and Shiva's golden matted hair, from which emerges the river Ganges and the moon. His golden feathery wings hold tiny deities, and his belly the sun-the whole world is contained within Shiva Sharabha. 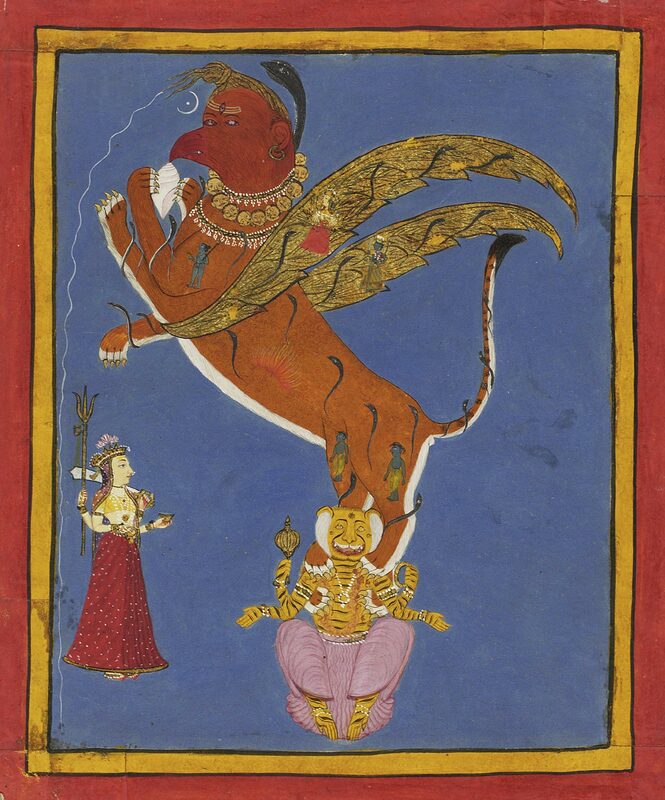 Below sits four-armed Vishnu-Narasimha, who has the body of a human, but the head and coloring of a tiger.